Mr. Kenneth Kong Chein attends day care sessions at St. Andrew’s Senior Care (SASC) (Tampines) 5 days per week. Apart from having hearing impairment, Mr. Kong was diagnosed with dementia a few years ago. As his condition worsened, he would stay at home often as it was unsafe for him to travel alone. 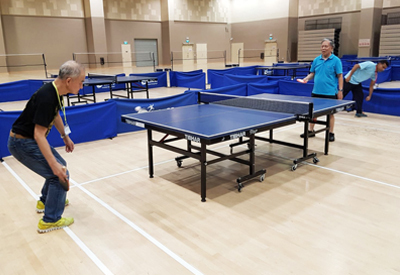 A client of SASC (Tampines) since September 2017, Mr. Kong is actively engaged in social and recreational activities and well-known as “The Helpful and Cheerful One” to both the care team and clients. Besides reading the newspapers to keep himself updated on current affairs, he also pursues his interest in colouring at the care centre as he used to be a fine arts practitioner. With SASC (Tampines) being located at Our Tampines Hub (OTH) where sports facilities are available, Mr. Kong is able to join the care staff and his peers in walks as well as sports activities. He has even proven himself to be a great table tennis player! With Mr. Kong receiving care at SASC (Tampines), his sister who is his main caregiver, can now have peace of mind to focus on preparing for her sign language classes as a teacher and carrying out household errands. an auditorium at OTH, where SASC (Tampines) is located.